This entry was posted in Reflections, Week6 by Ran Jin. Bookmark the permalink. 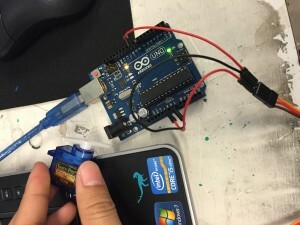 I didn’t get to work with Arduino this past week and it seems really cool! It’s incredible that you learned to create a circuit board in a matter of a couple hours. It really shows that such technology that we originally thought is so foreign can be easily picked up, and used in every day life! I thought our time with the electronics was also a good time to confirm conceptual ideas with professional staff. I had the idea of turning the light on with my sensor but didn’t think it was possible at first (because I had been using the wrong code). But after simply asking Colten, he affirmed it was possible and Elaine and Toheeb were able to help me 🙂 Certainly helps you brainstorm ideas when you’re surrounded by people who know what they’re doing!